My Review: In many ways this book is very disturbing. It is a tale of death and survival on K2, the world’s second highest mountain. K2 is arguably the world’s most difficult climb. 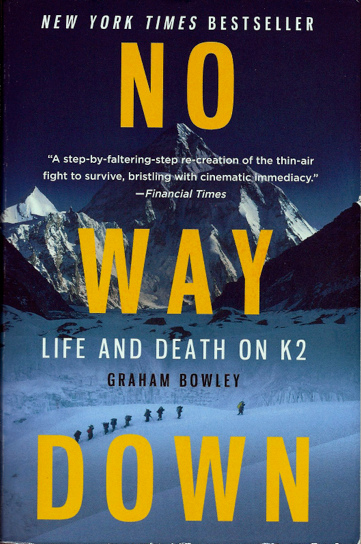 Unlike Touching the Void, Joe Simpson’s harrowing tale of survival against all odds, or John Krackour’s book, Into Thin Air about death and heroism on Everest, No Way Down is less about heroism and survival, and more about death and despair in the death zone above 26,000 feet. Most mountaineering tales that describe the loss of climbers detail someone falling or sliding over a cliff into a void thousands of feet deep, never to be seen or heard from again. There is no first hand knowledge of the suffering the falling climber experienced after the fall (Joe Simpson’s book is an exception, but his heroic self-rescue is very uplifting). In this report however, there are several stories detailing the suffering of injured and dying climbers. The most wrenching story is of a mountaineering couple. The husband who asked his wife to wait while he checked out the trail ahead only to be swept to his death right in front of her by falling ice. Several survivors experienced in graphic detail the suffering and death of companions whom they could not help. The most horrific of these was the experience of the Italian and Irish climbers who while descending K2 came upon three climbers, two Koreans and a Sherpa, badly injured and hanging from their ropes and harnesses against an ice wall. They had been swept away while roped together by another icefall from the overhanging serac (overhanging ice shelf). One was upside down and bleeding badly, a second was hanging unconscious and a third was badly injured, sitting on a ledge, held in place by the ropes. The Italian and Irish climbers, in poor condition themselves, worked to relieve the suffering of the three until the Irishman, out of his mind with altitude sickness, headed back up the mountain. The Italian climber promised to call for help and left the three and the delirious Irishman in an attempt to save his own life. Later that day, more of the serac collapsed, hurling the trapped Koreans to their deaths past other survivors. The Irishman, knocked off the mountain in the same avalanche, tumbled down with and among the ice blocks. He finally came to rest near the Italian who had narrowly avoided the avalanche himself. The Italian climber could only identify his friend by the clothing he was wearing, as his head had been completely destroyed, with brain tissue, bone and even eyes spread out in the rubble. Eleven people in all lost their lives on the mountain between August 1 and August 3, 2008. Several of the survivors had to be evacuated for serious medical conditions, usually frostbite. Several lost toes and fingers. Some suffered long term PTSD. A few vowed to give up mountaineering entirely. Most said they would never return to K2. But a few were drawn back to the mountains. One Korean, a woman who had summated K2 on August 1 and survived, had a goal of climbing all the world’s 26,000 foot mountains. She died a year later in the death zone of a nearby peak. I have some appreciation of why people climb mountains. My brother-in-law is a mountaineer. I can also understand why people who become skilled at a sport want to test themselves with more difficult challenges (See the review Without a Paddle). I do that in my kayaking. But I have no desire to put my life at risk the way these people do, climbing in the death zone above 26,000 feet, knowing that the chances of a harrowing death, injury or amputation are very great. This book is a good if harrowing read. I would recommend it if you have read other stories of extreme survival situations in the mountains. If you are new to this genre, read Joe Simpson’s first person tale, Touching the Void, first. It is so good and uplifting that I have read it several times.